An electrolysis method that removes CO2 from seawater could be affordably scaled up for commercial carbon sequestration. 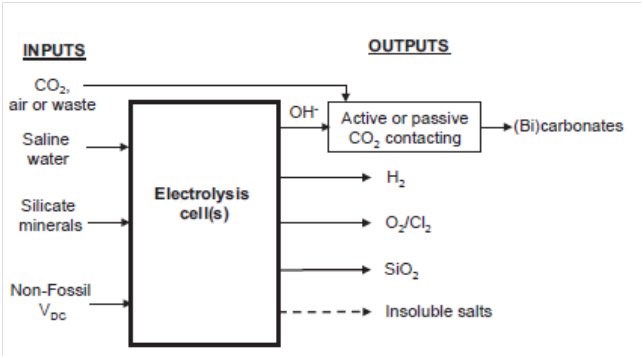 WHAT: An electrochemical method of sequestering CO2 from sea water using silicate rocks. 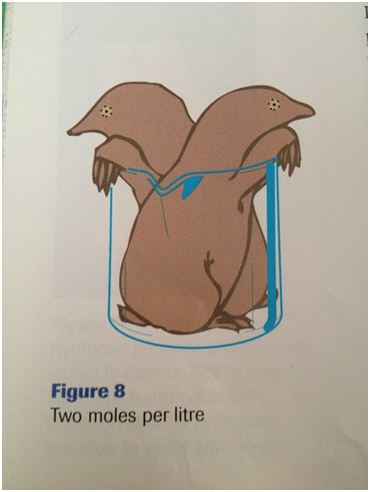 This paper was fun – I got to get my chemistry nerd back on thinking in moles per litre and chemical equations! It almost made me miss university chemistry lectures. So what does chemistry jokes have to do with carbon sequestration? It’s looking increasingly like humanity is going to have to figure out ways to draw carbon out of the atmosphere or the oceans because we’ve procrastinated on reducing our carbon emissions for so long. There’s two options for this – you can either create a chemical reaction that will draw CO2 out of the air, or you can create a chemical reaction that will draw CO2 out of a solution, and given how quickly the oceans are acidifying, using sea water would be a good idea. The good news is; that’s exactly what these researchers did! Silicate rock (which is mostly basalt rock) is the most common rock type in the Earth’s crust. It also reacts with CO2 to form stable carbonate and bicarbonate solids (like the bicarbonate soda you bake with). Normally this takes place very slowly through rock weathering, but what if you used it as a process to sequester CO2? The researchers created a saline water electrolytic cell to test it out. An electrolytic cell is the one you made in school where you had an anode and a cathode and two different solutions (generally) and when you put an electric current through it you created a chemical reaction. What these researchers did was put silicate minerals, saline water and CO2 in on one side, and when they added electricity got bicarbonates, hydrogen, chlorine or oxygen, silicates and salts. So how did the experiment go? It worked! They got successfully sequestered carbon dioxide with an efficiency of 23-32% that sequestered 0.147g of CO2 per kilojoule (kJ) of electricity used. There are issues around the scaling up of the reaction of course – once the bicarbonate has been created, where do you store it? The paper suggested ocean storage as the bicarbonate solids would be inert (un-reactive). I would hope that a re-use option could be found – has anyone looked into using bicarbonate solids as an eco-building material? There’s also the issue of needing to power the reaction with electricity. If scaled up, this process would have to make sure it was powered by renewable energy, because burning carbon to sequester carbon gives you zero. Also, if sea water is used, the main by-product is Cl2 so the researchers point out that while it would be feasible to do this process directly in the ocean, the issue of what to do with all that chlorine would need to be dealt with. The paper suggests using oxygen selective anodes in the electrolysis, or ion-selective membranes around the reaction to keep the chlorine separate from the ocean. That being said, there are some exciting upsides to this process. The paper points out that the amount of silicate rock in the world ‘dwarf[s] that needed for conversion of all present and future anthropogenic CO2.’ Also, using sea water is an easier way to sequester CO2 rather than air-based methods. Scaling the method up is economically feasible too. The researchers estimated that 1.9 MWh (megawatt hours) of power would be needed per metric tonne of CO2 sequestered. If the waste hydrogen from the process were sold as hydrogen fuel for fuel cells, the price of CO2 sequestered would be $86/tonne. If the hydrogen fuel wasn’t feasible, it would still only be $154/tonne, which compares very favourably to most current carbon capture and storage feasibility estimates of $600-$1000/tonne of CO2. So, like an antacid for the oceans, if this process can be scaled up commercially through research and development, we could have an effective way to not only capture and store carbon, but also reduce ocean acidification. A good-news story indeed – now we just need to stop burning carbon.